Didier Ottinger: Surréalisme et mythologie moderne. Les voies du labyrinthe d’Ariane à Fantômas. Gallimard, Paris, 2002. A contemporary (and not very much abridged), thematic version of the Dictionnaire abrégé du surréalisme would look in many ways like Didier Ottinger’s book. That’s the sense in which we could call it The Short Encyclopedia of Surrealist Myths. However, the chapters of the book follow more or less also a historical logic – in this attempt, one of its closest possible models could be Sarane Alexandrian’s Surrealist Art, where the different historical stages are connected to major themes and techniques. Obvious or not, surrealist mythology is strongly connected to the story of the Labyrinth. One of the key figures of the mythology outlined by art historian Didier Ottinger in his book is the Minotaur, another one is Pasiphae, the Minotaur’s mother. Ariadne with her thread leading Theseus out of the labyrinth is herself the heroine of the second chapter in the book. Dionysos who ‘marries’ Ariadne has also a chapter of his own. 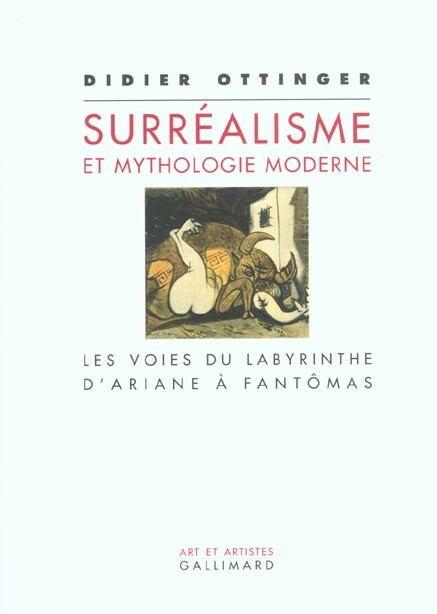 All this means that the author insists on surrealism’s attempt to create a new, collective mythology – in Breton’s and Aragon’s terms –, and also that the focus of the book is on the later phases of surrealism, after the publication of one of the most interesting reviews that involved surrealist artists: Minotaure (1933–1939). Although some of the references in the book could be criticised , and some of its chapters seem just sketches of the issues discussed as compared to other chapters of the same book, there are some important decisions behind the basic assumptions of Ottinger that are worth to be signalled: 1. some aspects of Georges Bataille’s work are crucial to the interpretation of surrealism, if the problems of mythology and of the Minotaur are concerned. Bataille is the central character in at least two chapters of Surréalisme et mythologie moderne; 2. the psychoanalytical links to Freud and Jung are stressed upon – while for the French artists Freud is the partner for their intellectual dialogues, Jung will be a key reference for the American artists in the fourties (Pollock, Gorky) – and one of their bases for delimitation from surrealism. This could lead us to another question (not discussed in the book) about the relationship of the “collective myth” of the surrealists and Jung’s “collective unconscious” which is precisely one of the main reasons of dispute between Jung and Freud; 3. much of surrealism’s reception in the last decades passed through the United States which also means that it was seen through the art’s evolution in the States. This is obviously just one of the possible ways of looking at the phenomenon and should not be exaggerated. Acephalos – key figure as far as the connection between myth and community is concerned. Freud speaks in Totem and Taboo about the ritual sacrifice of the chief of the tribe as a foundation for human society. Acéphale is also a review directed by Bataille, in the period when one of the main concerns of surrealists and their allies was to promote anti-fascism. Ariadne – an intensive presence on the works by Giorgio de Chirico, therefore a key myth for early surrealist painting. The references go back to Nietzsche The Birth of Tragedy, one of de Chirico’s favourite readings. Ariadne, a representation of ancient, ‘obscure’ greek culture helps Theseus, the rational hero out of the Labyrinth, but she is abandoned later on at the island of Naxos. Ariadne’s thread is present as a visual element in works of Picabia, Picasso and others, and it is a central element of the 1942 New York exhibition, First Papers of Surrealism, conceived by Marcel Duchamp. Dionysos – a rediscovery of the origins of mythology and of the specific attitude represented by the god in Nietzsche’s interpretation. Ottinger insists on the fact that after the second world war the chances of a mythical approach to the world were reduced or transformed radically. Fantômas – the 20th century dandy who is at home in the labyrinth of the modern city. He belongs to the nocturnal world and to the ‘landscape’ described by Aragon in The Paris Peasant. He appears on paintings by Magritte, Tanguy, Brauner and others. Golden Age – The title of the film by Bunuel may also represent André Breton’s concern with utopia. The Great Transparents – one of the attempts in the fourties to name the central element of the ‘collective myth’ of the surrealists. André Breton, Roberto Matta, Marcel Duchamp and Jacques Hérold tried to represent them in different ways. Handler of Gravity (Soigneur de Gravité) – figure conceived by Marcel Duchamp, a variant of the Great Transparents that marks also the return of the surrealists to Paris after the second world war. Minotaur – the keeper of the secrets of the labyrinth, one of the emblems of surrealism, and its ally in confronting the excesses of rationalism. The concept of the review Minotaure is discussed here at large. The Moon Woman – emblem of the mythical orientation of the New York painters (Pollock, Rothko etc.) during the fourties in connection with their meeting with surrealist works or not. The Mothers (Les Mères) – Masson’s, Tanguy’s and Arp’s “genetic” images but also Brauner’s La Mère des mythes, all representing the principle of birth. Pasiphaé – mother of Ariadne and the Minotaur, she is an emblem also for the wild desires and sexuality discussed by the surrealists. Pythia – the premonitory aspects of Surrealism can be embodied by this motif. Episodes connected to different types of automatism are discussed here, and also paintings like Portrait premonitoire du Guillaume Apollinaire by de Chirico, or Autoportrait by Victor Brauner. Quetzalcóatl – the serpent-bird of Mexico represents the Latin-American connection of the surrealists, not very well developed here. We can see how changing the chronological order disrupts here also the narrative of the book. Also, the transfer to another language creates different a order of the entries (in French, the last entry would be Le Soigneur de Gravité). The elements of the mythology may stand out though even better without the narrative frame.